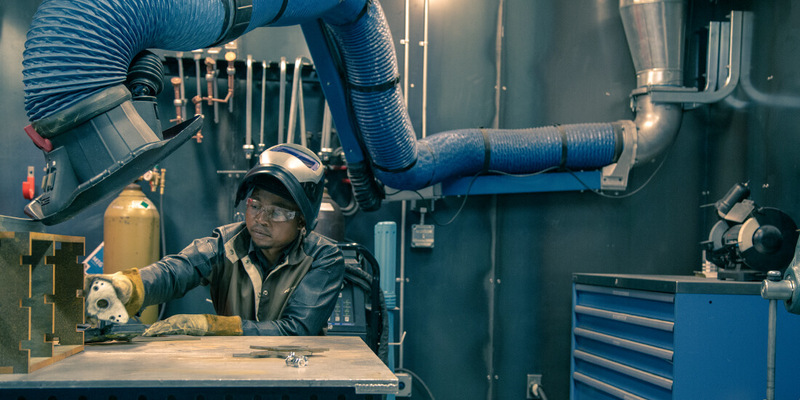 William Maluki works on creating his CNC pipe-bending machine in residence at Autodesk Pier 9 Fabrication Workshop. In Kenyan towns large and small, an informal network of craftspeople, autoworkers, and small-scale manufacturers keeps the country’s economy quietly humming. These fixers and makers create and build whatever’s needed, often with limited resources. Called the Jua Kali, this group of versatile artisans is a vital and growing element of the Kenyan economy, but mass producers and cheap goods from Europe and Asia are threatening their way of life. However, if William Maluki has his way, the future of at least one Jua Kali group will be secured, perhaps bolstering Kenya’s ad-hoc manufacturing jobs for years to come. A male Jua Kali worker in Kenya uses a homemade welder. Courtesy Erik Hersman—CC by 2.0 license. 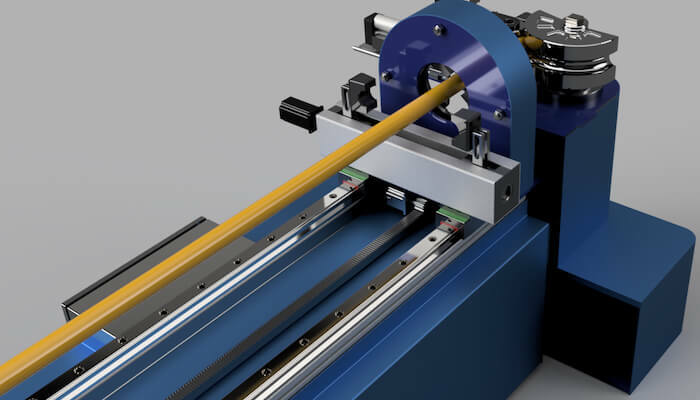 Maluki, head of engineering at makerspace Gearbox in Nairobi, Kenya, is pioneering a new CNC-based pipe bender. 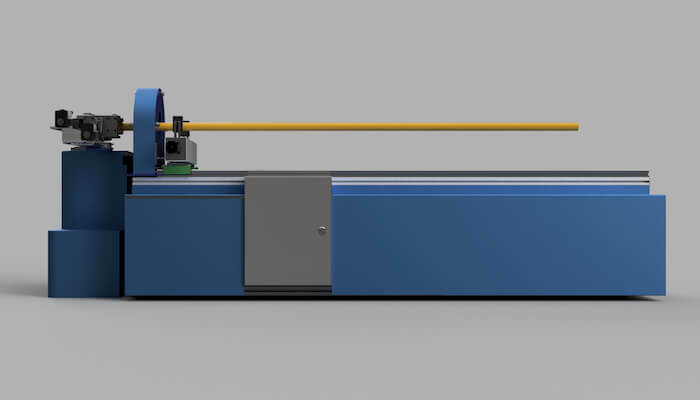 Designed for manufacturers of metal frames—think wheelbarrows; steel-tube furniture; or seats for matatus, Kenya’s fleet of privately owned minibuses—this machine will allow makers to create identical frames in less time with precise and consistent output. “The philosophy is, if the process quality is secured, then the product quality is guaranteed,” Maluki says. Jua Kali is Swahili for “fierce sun”—an homage to the fact that many of these tradespeople work along busy roadsides, often without a formal shop to shield them from the intense rays bearing down from above. A Jua Kali manufacturer can be one person or a small collective of people producing one-off or small-scale batches of products. A worker takes advantage of the advanced tools available at the Gearbox makerspace in Nairobi, Kenya. Courtesy Gearbox. Many of the makers in the Jua Kali sector learn from hands-on experience earned through years of working alongside other makers rather than from formal education or training. Their profit margins are small, but in a country of more than 48 million people, this group manages to make a modest living. Many of the Jua Kali lack sophisticated equipment—a luxury few can afford. While not entirely rudimentary, the tools at their disposal are light-years away from the CNC machines, 3D printers, and Haas mills of Europe, Asia, and America. In turn, their products are often satisfactory and inexpensive but are sometimes seen as not only cheaper but also of lower quality, and they can’t always compete with imports. But with Maluki’s pipe-bending machine, these small businesses might soon be more competitive with large-scale mass producers, making a profit and keeping an important economic aspect of Kenya alive. 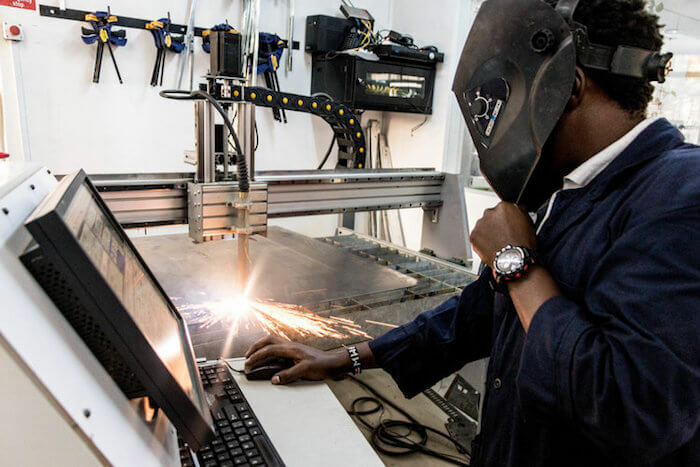 William Maluki spent four months designing and building his CNC pipe-bending machine at the Autodesk Pier 9 Technology Center. Courtesy William Maluki. Unlike most pipe-bending machines today, Maluki’s machine will be completely electric. Courtesy William Maluki. To be more economically accessible to the Jua Kali, who often work barely above profit margins, Maluki says his machine will charge by the bend, rather than by the batch of items. Courtesy William Maluki. Maluki plans to harvest the data from his machine’s computer to create the second generation of pipe-bending machines to help makers produce faster and cheaper. Courtesy William Maluki. 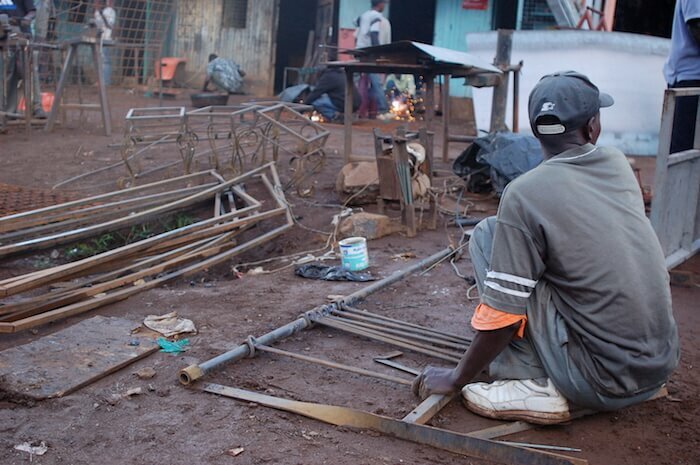 Maluki hopes his CNC pipe-bending machine will help people trust the quality of Jua Kali sector products a lot more. Courtesy William Maluki. Earlier this year, Maluki spent four months designing and building his pipe-bending machine at the Autodesk Pier 9 Technology Center. 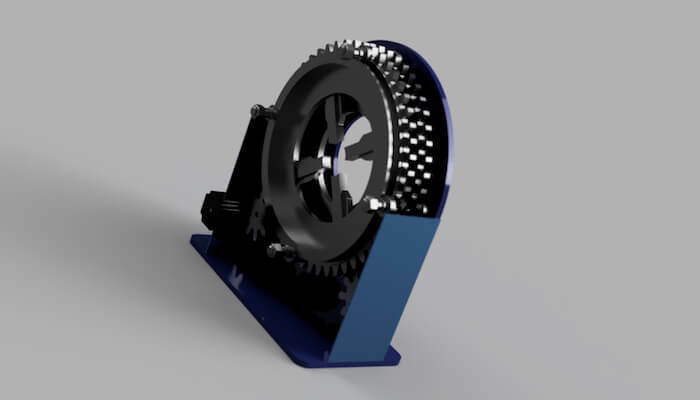 There, he was able to take advantage of state-of-the-art prototyping equipment and collaborate with experienced staff and industry leaders through feedback sessions organized by the Pier 9 and Autodesk Foundation management to hone and shape his pipe-bending prototype. 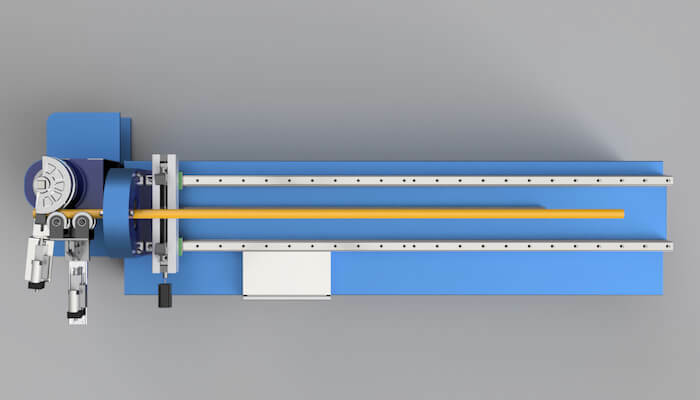 The machine, which will have CNC 3D-bending capability, takes in user parameters, including various design measurements, and then outputs a real-time graphical render of the pipe as it will be bent. 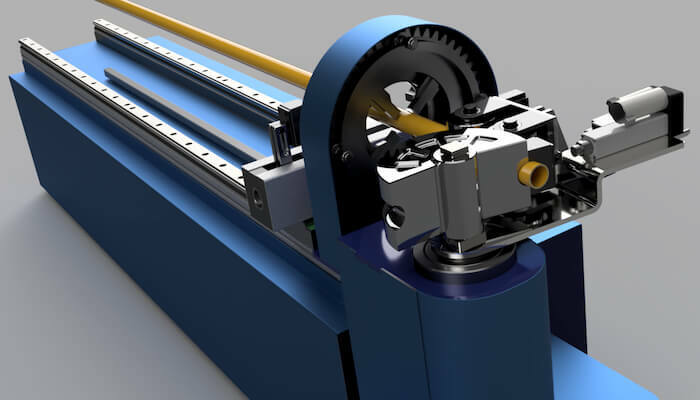 Most pipe-bending machines today are largely hydraulic and difficult to maintain, but Maluki’s machine will be completely electric, which is important to fit into the Jua Kali business model. Explore the technology centers driving manufacturing innovation. Explore the centers driving manufacturing innovation. Plus, to be an economically accessible option for the Jua Kali, who often work barely above profit margins, Maluki says his machine will charge by the bend, not by the batch of items. “The ballpark figure is 50 shillings, which is about 5 cents US per bend,” he says. Maluki plans to harvest the data from the machine’s computer to create the second generation of pipe-bending machines to help the Jua Kali and other makers produce faster and cheaper. The data will also allow for customization so the artisans can produce products even cheaper and more efficiently. Now back in Kenya, Maluki is one step closer to delivering his dream to the people he’s aiming to serve. Success for Maluki won’t come when he gets his first pipe-bending machine up and running. It won’t come even when he’s placed 100 machines in shops. Instead, he says, it will come when someone a lot like him—a creative thinker with a great idea—tries something unique and discovers an all-new way to use this machine Maluki has spent so many hours thinking about, creating, and building. “The longer impact that I hope this will have: People will start trusting the wares that are made by the Jua Kali sector a lot more,” he says. “Then, in the future, they will command a bigger market share in the economy and create the all-too important jobs.